Kids Music That Won’t Drive You Nuts! 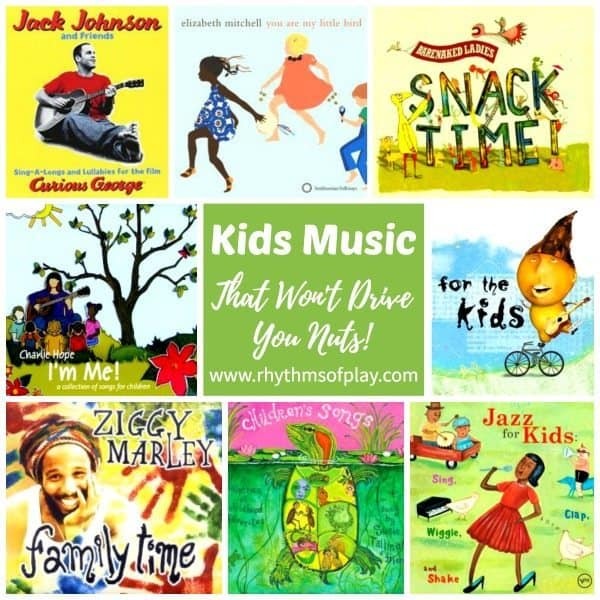 Kids Music – Music for Kids That won’t Drive you Nuts! I know of two things in particular that can drive any caregiver crazy in seconds. Obnoxious toys that make awful noises and terrible children’s music. Is there anything worse? As a teacher and childcare worker turned mom, I have spent many years learning what types of kids music to avoid at all costs–even when it’s free. Below you will find some of MY favorite kids’ music that won’t drive you nuts! You may also like Kids Books That Teach Important Life Lessons. This article contains affiliate links for your convenience. Thank you for choosing to support this blog! Each of these kids music album’s can be enjoyed anywhere. Whether you are on a road trip, having music time, or just playing and hanging out there is something for everyone here. This is not a static list. I update it often with new fun CD’s my family loves. Be sure you bookmark it and check back often! I have listed them by the artist (or title of the compilation) in alphabetical order by their first names. Some artists have several albums. Music for Kids That Won’t Drive You Nuts! This is a great album by a well-known Canadian Rock band. The Billy Jonas Band loves to engage and delight both young and adult audiences with spirited, thought provoking lyrics for everyone! With original songs, daring harmonies, a mix of homemade “re-percussion” and conventional instruments, audiences will fall in love with every note! Caspar Babypants is also known as Chris Ballew – the lead singer for the Seattle rock and roll band The Presidents of the United States of America. Caspar Babypants is not my absolute favorite of the artists that I have listed here, but I have many friends of all ages and backgrounds that love him. When I first heard Charlie’s music I was in love. I thought, wow – Good kids music really does exist! Her original songs are excellent, catchy and easy to sing along to. Charlie also includes a lot of classic children’s songs on her CD’s and I absolutely LOVE her versions. Many have become my all time favorites. Songs, Stories and Friends: Let’s Go Play! The late Jerry Garcia, lead guitarist for The Grateful Dead, was never known for the kind of upbeat vocals typically associated with children’s music. The songs are catchy and fun, and Jerry and Dave’s voices are such a pleasure to listen to. Overall this album offers an appealing assortment of toe-tapping American folk tunes whose simple lyrics and old-fashioned harmonies appeal to the kid in all of us. Elizabeth Mitchell has a lovely voice that brings a fresh sound to American folk songs and other melodies from around the world. These are some of my absolute favorite albums. Her sweet and melodious voice can carry you anywhere you want to go. There is something for everyone in the family to be found on this wonderful collection of CD’s. These are not by a particular artist but are compilations by many of today’s popular artists. Contrary to the title, this album is not just for the kids, adults will also have a good time listening to these delightful songs by some of today’s most successful contemporary artists. One of my favorites is Sarah McLachlan’s rendition of Kermit the Frog’s “The Rainbow Connection” on the first album. If you are going to choose only one of these the first is the best. Frances England delivers unique heart-infused lyrics that can be generally described as Indie and/or Folk. Her inventive and catchy music will capture the imagination of children (and adults) everywhere! This is one of those lovely soundtracks which kids will love and adults will find just as wonderful. Laid back Hawaiian surfer Jack Johnson’s easy breezy whimsy is just right. Happy strumming, never in any hurry, and with cheery little stories and lessons embedded into the lyric – Love it! This is a wonderful assortment of artists and songs for all to enjoy. What I really appreciate is that it introduces the Jazz form to the kids at an early age. It is a marvelous introduction to a staple genre complete with songs from many well-known jazz artists. Highly recommend. Karma Kids Yoga is not just for practicing yoga. It features an eclectic mix of musical styles, including rock, reggae, disco, country, new age, and rhythmic chanting. Kids can practice yoga along with popular songs, or they can just chill out and enjoy the groove. You may also like Kids Yoga: Tips for Getting Started. Come Play Yoga – Our family loves listening to the CD below for chilling out at home. Each track on this aims to inspire strength, confidence, imagination and inner peace in children (and adults) everywhere! I love that Laura Berkner has put out a best of and ultimate album. In them, she has included all the songs that I love. Because of this, I am listing them along with her lullaby album as opposed to everything she has done. Her songs are mostly about action and can really get everyone up and moving. They are common songs about the things kids love to do and say… buzz buzz! Acoustically rock your kid’s world with Laura Doherty – an award-winning performer and producer with an ear for a catchy kids music! There are some really adventurous things on this album that are sure to captivate the imagination and playfulness of all listeners. There is a balance of vocal oriented songs and the type of funk infused Rock instrumentals that have become the hallmark of Medeski, Martin and Wood. This album has something for both adults and children. The only downside of this catchy music is that it can get old quickly. Even so, it is still one of our favorites. My daughter and I participate in Music Together music classes for children and their caregivers. I am not affiliated with this program in any way. I am recommending it because I love the program and the music they use. I find myself listening and singing along to their CD’s even when my daughter is not in the car. The program connects families and communities across the globe as they express and explore our basic human instinct for making music. To find out more about the program and if it is offered in your community click here. Learn More about the Music Together albums and listen to some of the music. Early childhood educator and composer Nancy Kopman has been creating, testing, developing, recording and performing her short, catchy, award-winning educational songs for children 0-10 for over 20 years. She writes interactive children’s music with a purpose. A few of her wonderful CD’s can be found below. Raffi is one of those that may make you crazy if you listen to any particular CD for too long, but I would be remiss if I did not include him. He has several albums and a classic style for everyone to love. I may not be able to listen to one of his albums from start to finish, but I love to include some of his works in the mixed CD’s and playlists that I create. He has made many albums so I am only sharing a few below. Renee and Jeremy are a family favorite in our home. They make children’s music for people of all ages the whole family is sure to love! A few of their CD’s can be found below. Susie Tallman has a unique skill at combining traditional children’s music, a beautiful singing voice, a playful approach, and a remarkable ease to well-known songs. If there is a particular song that drives you crazy, it’s usually not her fault. She does a great job of delivering “kids music” in an easy to tolerate manner. Family Time by Ziggy Marley is one of my families favorite CD’s. It is upbeat, happy and fun. Toots Hibbert, Paul Simon, Rita Marley (Ziggy’s mom), Cedella Marley, Jack Johnson, Paula Fuga, Elizabeth Mitchell, and Laura Berkner all make appearances in this CD. The final two tracks are not songs, but narrations by Jamie Lee Curtis that contain meaningful messages for the whole family. Good quality albums with real music for you and your children to enjoy can be hard to find. Whether you are on a family road trip, having music time, or just playing and hanging out there is something for everyone here. 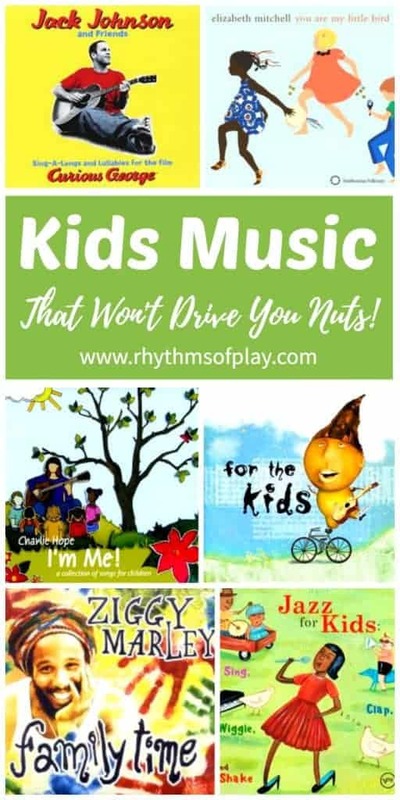 Kids music (that won’t drive you nuts) makes a great gift idea and stocking stuffer! To learn more about Rhythms of Play click on the link! These look great, I will have to check out some of the ones I haven’t heard of. Thanks for the suggestions! We love silly songs that teach things. I also found out recently that the Curious George movie songs are pretty cool. We also love Eric Herman, music from Yo Gabba Gabba, Jack’s Big Music Show, and Wow Wow Wubbzy. You’re welcome, Channon! I can’t tell you how many times I have wanted a list like this or wanted to know if an album was any good. I would have loved to have found this list a few years ago! Subscribe to our newsletter to receive your FREE weekly planner! Join the Rhythms of Play community to get organized, connect with your kids, and find the FREEDOM to do the things you LOVE!